I always thought that Urza’s Saga had some very good flavor elements – the parts of the block that related to Argoth and Serra’s Realm were always very poignant to me. Since the Weatherlight Saga ended in tragedy and the Time Spiral block was a literal post-apocalyptic wasteland, I was somewhat surprised that Dominaria had a rather more hopeful reference to the Brothers’ War. Titania’s quote on Nature’s Spiral might be viewed as Magic’s equivalent of Arthur being alive in Avalon. It’s late, too late for some players, but late is better than never, and if Magic does manage to change, perhaps there is hope for everything. We don’t get a huge number of cards that specifically encourage committing to one color nowadays. Dominaria did include a powerful cycle of such cards, another reference to a time when cards like Blanchwood Armor were more common. It carries the issue of single-colored decks plus the issue of Auras, but nowadays there are creatures that are better at using them than we got in 1999 – Silhana Ledgewalker and Elderwood Scion both make good targets, for example. It doesn’t do quite enough for the competitive environments, but it can dominate an opponent who is unprepared for it. 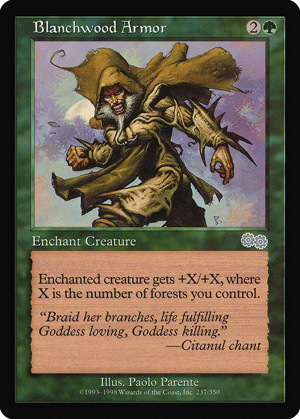 In limited, a two-colored deck will often have enough forests to get a good advantage from using it, and if you have lands like Temple Garden and Canopy Vista, it’s a solid target for casual Retether decks. Until tomorrow, bend with the wind, and make time for mono-colored decks. To be fair, Blanchwood Armor will almost always do something; on-curve, if you’re mono-green (or have a bunch of dual lands that are Forests), you’re spending 3 mana to give +3/+3 that does not go away at the end of turn. Unfortunately, you’re just giving combat stats. Historically, the creature Auras that have been playable have been the ones that have granted more than just pure numbers or, if they granted pure numbers, were well above their rate. Blanchwood Armor is a card that asks for a lot of time. Or mana acceleration. And the payoff isn’t great, unless you attach the Armor to a creature that’s threatening enough on its own! Don’t get me wrong, this card is not useless. But you’ll rarely find that it does enough; pure numbers on an Aura aren’t usually enough unless the Aura is super-overpowered to begin with.